Vancouver offers some of the best and most unusual modes of transportation of any city in the world. You can travel by air, land and sea: by boat, ferry, train, gondola, bus, float plane, helicopter, subway, bicycle and by foot. Listed below are the most exciting and most enjoyable ways of getting around in Vancouver. 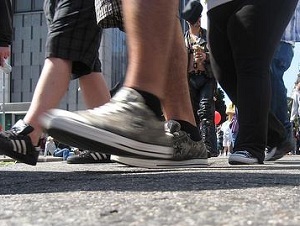 – One of the best ways to get around Vancouver is on foot. The downtown core is compact, scenic, historic and very safe, and walking is a wonderful way to explore from a human perspective. You’re not whizzing through, flying over or floating by. but seeing it slowly and at eye level. around Yaletown, Chinatown, Gastown and along Davie Street in either direction. Perhaps, Vancouver’s best walk is the Seawall walk that spans 22 km (13.7 miles) and follows Vancouver’s coastline from the Vancouver Convention Centre, around Stanley Park, past Second Beach and English Bay Beach, around False Creek, through Yaletown and Granville Island. The walk ends at Kitsilano Beach. En route you’ll go over or under all three bridges that link downtown with the rest of the city: Burrard Bridge, Granville Bridge and Cambie Bridge. If you want to halve the hike, you can do so by eliminating the False Creek portion. Instead, cross the Burrard Bridge and walk to Kits Beach from the end of the bridge. – We might as well start here because the Canada Line skytrain station is a short walk from Vancouver International Airport Arrivals. The Canada Line skytrain, a light rail system, transports you from the airport to downtown Vancouver in 26 minutes. Can’t beat the speed, convenience or price.You can purchase tickets at the airport station before you board the train. 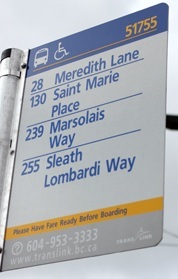 Use the bus stop number located in the upper right hand corner of the bus stop sign, (51755 in the picture to the right) to identify your location and get the arrival time of the next bus. Buses require exact fare so you will want to have some Canadian coins: preferably dollar (loonies) and two dollar (toonies) coins before you board the bus. You can purchase Canadian coins at an airport currency exchange kiosk or you can simply make a purchase, pay with US or Canadian dollars and get Canadian change. Three trains depart Vancouver: The Rocky Mountaineer train travels between Vancouver and the Canadian Rockies from the last two weeks in April until the first week in October. Once a week during this time, the Rocky Mountaineer goes as far as Calgary. The Rocky Mountaineer also travels to Whistler from May 16 to September 24. The ViaRail train travels between Vancouver and Jasper, Edmonton, Toronto and Montreal twice a week in fall and winter and three times a week in spring and summer. The train leaves Vancouver at 8:30 PM on Tuesday and Friday or, in spring and summer on Tuesday, Friday and Sunday. The West Coast Express is a commuter train that brings passengers from the Fraser Valley to downtown Vancouver each morning from Monday to Friday and returns them to the Fraser Valley in the evening. The train does not operate on weekends or during the middle of the day. – also called Seaplanes – Because Vancouver is surrounded by water on three sides and because Victoria, the capital of British Columbia, is located on an island, Vancouver Island, 39 miles from the mainland, Vancouver relies on float planes. Float planes transport people and packages back and forth between Vancouver and Victoria and between Vancouver and Nanaimo, the second largest city on Vancouver Island more than 50 times a day. Vancouver’s downtown float plane terminal is located in Coal Harbour, right downtown and next to the Convention Centre. From downtown Vancouver, flights are available to and from Victoria, Nanaimo, and Whistler. 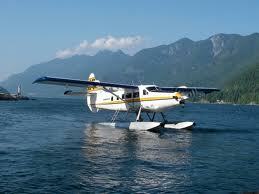 And although flights are weather dependent, there are not many days a year when the float planes don’t fly. Only dense fog and extreme weather conditions ground them. Otherwise, they reliably fly between Vancouver and Victoria in 30-35 minutes and between Vancouver and Nanaimo in 20 minutes. The most scenic flight, between Vancouver and Whistler, is available from May 18 to September 26. There are no flights to and from Whistler in Winter since Whistler’s Green Lake, the location of the Whistler float plane dock, is frozen in winter, so planes can’t take off or land. Flightseeing above Vancouver and the nearby mountains is available daily year round. For visitors wanting to see Victoria and the Butchart Gardens while you’re in Vancouver, then our Fly and Ferry option is the most enjoyable way to travel because you get both the float plane experience and the ferry experience. – Most people don’t know it, but Vancouver actually has three ferry systems. The biggest, BCFerries, is the main transportation system between Vancouver and the nearby islands, including Vancouver Island, and between Vancouver and the Sunshine Coast (part of the mainland cut off from Vancouver and the lower mainland by the Georgia Strait). The second ferry system operates in False Creek, a short inlet that separates downtown from the rest of Vancouver. 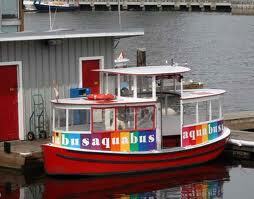 False Creek is served by the Aquabus. The Aquabus departs from the bottom of Hornby Street, Science World, David Lam Park at the bottom of Homer Street, Yaletown at the Marina on Davie Street, the Plaza of Nations Casino, Olympic Village and Granville Island. The SeaBus is a 12 minute passenger only ferry that crosses the Burrard Inlet that separates downtown Vancouver from the North Shore. The SeaBus operates between Waterfront Station in downtown Vancouver and the Lonsdale Quay Market across the Burrard Inlet in North Vancouver. Waterfront Station is the last Skytrain station in Vancouver, and only a short walk from the Canada Place Cruise Ship terminal, the Convention Centre, the float plane terminal. From the Lonsdale Quay, you can catch the #236 bus to Capilano Suspension Bridge and Grouse Mountain. The Lonsdale Quay is a destination in its own right with a food court, shops and wonderful views of downtown Vancouver from across the inlet. – This gondola provides transportation from the bottom to the top of Grouse Mountain. The one mile, 8 minute ride from the base of the mountain to the peak includes spectacular views of the city and North Shore. Once you get to the top of the mountain, you’ll find a lot to do. In winter, all winter sports are available. In summer, you can visit the Grizzly Bear refuge, ride the chairlift, watch a lumberjack show, eat lunch or dinner, have a snack, shop, watch videos of the area from an eagle’s perspective, ride the zipline, hike or visit the resident wind turbine (windmill), the Eye of the Wind. – Vancouver has miles of bike lanes on city streets, a separated bicycle lane across the Burrard Bridge and all 22 km of the Seawall is open to bicycles. There are a number of bicycle rental shops near the corner of Denman and Georgia in downtown Vancouver, adjacent to Stanley Park and bicycle rentals are available in Yaletown, Granville Island and other places around the city. You can get an idea of the number of city bike lanes, take a look at the Vancouver Bicycle Map.